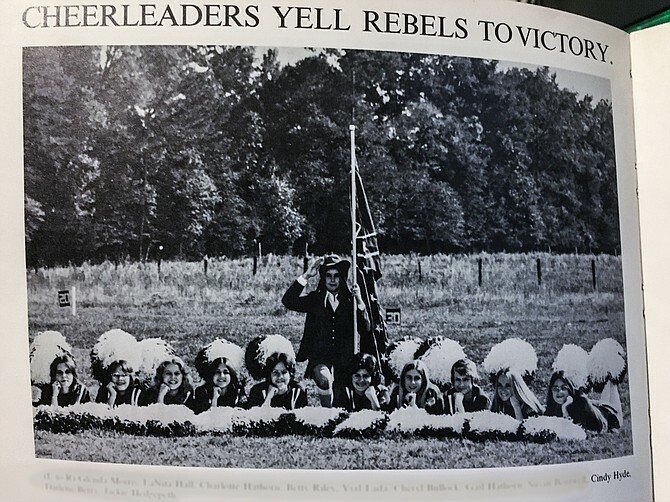 U.S. Sen. Cindy Hyde-Smith attended and graduated from a segregation academy that was set up so that white parents could avoid having to send their children to schools with black students, a yearbook reveals. Hyde-Smith enrolled her own daughter at Brookhaven Academy, another Mississippi segregation school founded in 1970, the Jackson Free Press reported. The latest race-related battle around Tuesday’s Mississippi Senate race with Democrat Mike Espy follows a recent leaked tape in which Hyde-Smith said that she would gladly attend a “public hanging” is one of her supporters invited her. The statement was outrageous, given Mississippi’s history as the lynching capital of the United States. One of the most famous lynchings in Mississippi was the savage and brutal death of 14-year old Chicago child Emmett Till. “I enjoyed my tour of Beauvoir. The Jefferson Davis Home and Presidential Library located in Biloxi,” Hyde-Smith wrote in a caption on this photos posted to her FB page in 2014. Davis was the Confederate president during the Civil War. His former estate now serves as a museum and library in his honor. I thought of Hillary Clinton, when reading this story. At considerable personal risk to herself, then 24-year-old law student Hillary was working for Marian Wright Edelman, the civil rights activist and prominent advocate for children. Mrs. Edelman had sent her to Alabama in 1972 to help prove that the Nixon administration was not enforcing the legal ban on granting tax-exempt status to so-called segregation academies, the estimated 200 private academies that sprang up in the South to cater to white families after a 1969 Supreme Court decision forced public schools to integrate. Hillary posed as a young wife, telling the guidance counselor of a seg school that her husband had just taken a job in Dothan, that they were a churchgoing family and that they were looking for a school for their son. Like many white activists from the North who traveled south to help on civil rights issues, Mrs. Clinton confronted a different world in Dothan, separate and unequal, and a sting of injustice she had previously only read about.